Thank you for joining me as we count down to the next MFT release. We are seven days away from the big day! All the new Stamps, Die-namics, and Stencils will be available on Tuesday, September 16th at 10:00pm EST. Be sure to check out the MFT Blog to see all the new items being revealed today. Don't forget to leave a comment on the MFT Blog Countdown posts, YOU could win one of the seven $75.00 gift vouchers. On to the fabulous tree! I used the Out on a Limb Die-namics and Chocolate Brown and Jellybean Green card stock to create the tree. I placed the tree trunk on the Kraft card stock and I used a template to place the leaves. For the template, I cut out the leaves from a piece of scrap card stock. I'll keep the template with this die so I can use it over and over again. I stamped a sentiment from the Out on a Limb stamp set onto a Fishtail Flag and I secured it with a Brick Red Button and a piece of Hemp Cord. I replicated the same overall design on the inside of the card. Have I mentioned how much I love that Mini Chicken Wire Background yet? My second card features the new Blueprints 19 Die-namics as well as the Out on a Limb stamp set and Die-namics. This new set of blueprints is just fabulous to work with! There are so many things you can do with that curved centre piece. For this card, I used the outside frame. 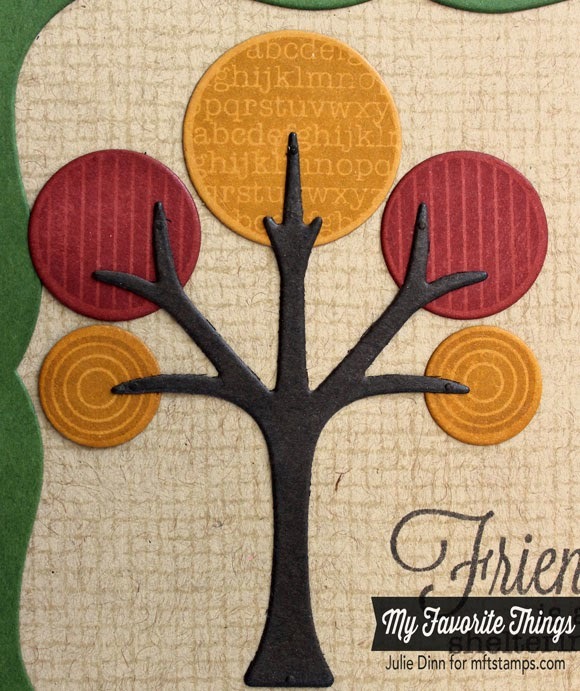 The Out on a Limb stamp set and Die-namics includes these fun circle shapes, as well as the leaves. There are a number of different patterns on the circle stamps so you can create a tree that is unique to you! I love having so many options with one set. I stamped my circles on Brick Red and Safety Orange card stock. I kept the inside of the card fairly simple. 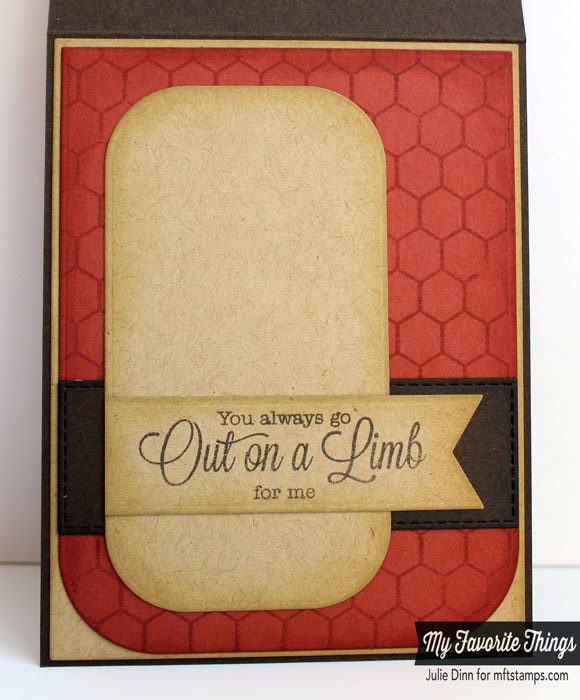 I stamped the background with the Burlap Background stamp. The pattern is subtle enough that you can easily write over top of it. 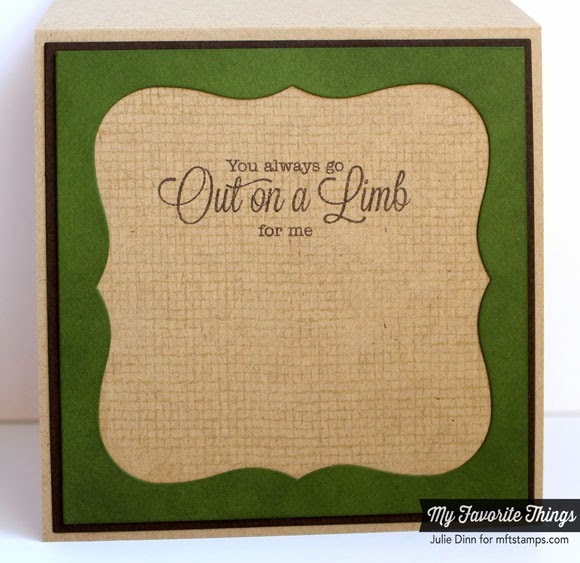 I finished it off with one of the sentiments from the Out on a Limb stamp set. The background stamping adds so much to the cards. fabulous projects, Julie! Love that tree! Love the Autumn Colors you used! 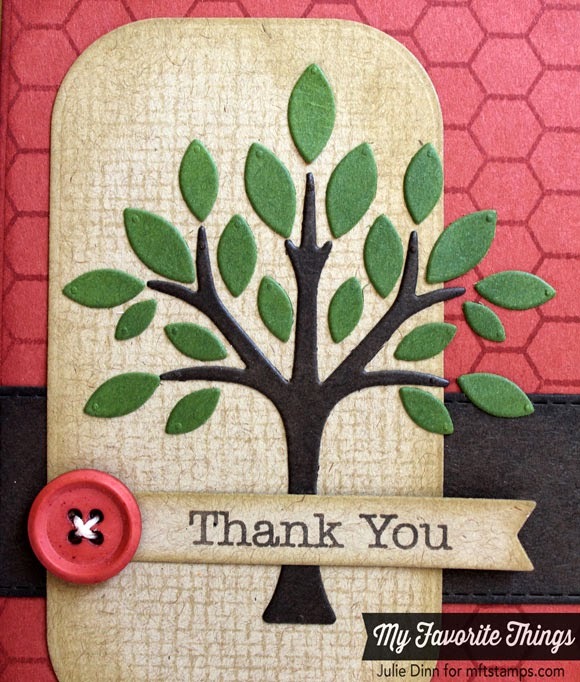 And thanks for the tip on how you placed the diecut leaves! Gorgeous card! beautiful cards, Julie, I love the burlap background!!! Awesome fall colors....thank you sharing about making the template. Julie this card just screams fall... what gorgeous colors you've chosen... thanks for using the Brick Red... I've been looking for this shade of red! Love all the textures and colors you used. Beautiful card! Oh my I love these cards! Beautiful creativity! Both of your cards are perfect! I love how clean your cards are. Colors are perfect and it makes me want to order this tree now! I love the warm colors of your first card Julie. Very autumn. And the button detail is spot-on. Thanks for the inspiration! I totally love everything about both your cards. From the Chicken Wire to the button to the Burlap....everything. I love your card and how the colors are so gorgeous!! I love how you combined it with the new blueprints too!! Oh Julie, I should have known this was your card, I love it! I Love the colors you chose, autumnal, the shapes, it's beautiful! And so is the second one! Thank you, as always, for sharing your creativity with us! Love all the great colors and textures, Julie. 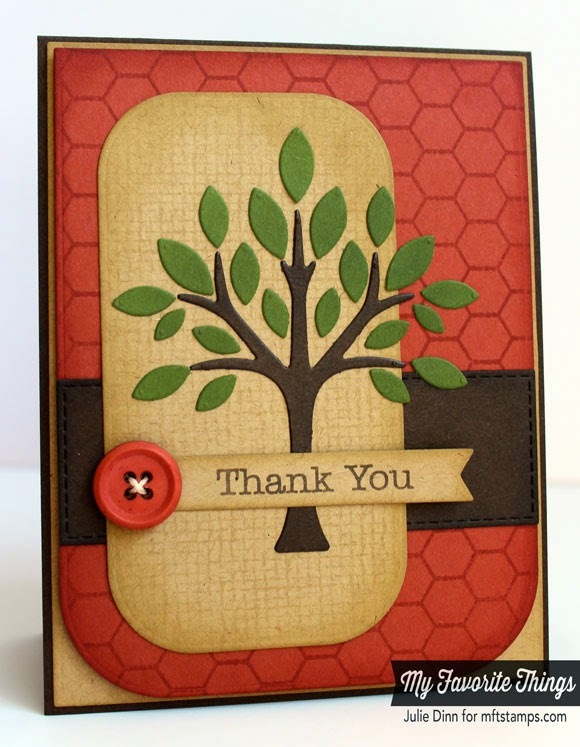 Terrific cards and great combination of colors and layout! 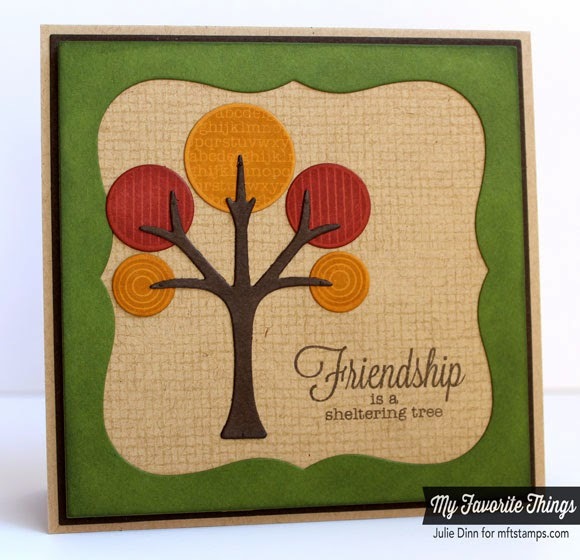 I like all the layers on the top card and the way the green tree stands out. But I absolutely LOVE the fall one. LOVE both your darling cards. The autumn colors are my favorite! Oh GF, these are wicked! I love the colours.